SUMMARY: Explanation about dog’s common medical issues, including cancer, vaccinations, operations, etc. AUDIENCE: Dog owners after some moral support, summary veterinary information, and communication strategies with the dog’s veterinary team when their dog’s health is hitting a snag. REVIEW: This book was somewhat of a revelation to me, at a time when I was particularly anxious about my dog’s health (unfounded fear, it thankfully turns out). 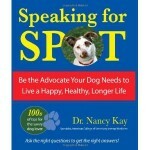 The book gave me just the boost I needed to feel empowered into acting as my dog’s medical advocate. The book demystifies scary issues like dog cancer and vaccinations, and gives you the tools to be a better decision maker for your dog. She made me feel less obsessive about all the research I do before going to the vet’s. In fact, she exhorts her readers to do so. She explains common and hi-tech procedures, and suggests communication tips to get a smoother and more efficient relationship with your vet and the para-veterinary team. Her personal accounts of her own, and her dog’s medical tribulations, contribute to the approachable feel of the book. And approachable she is! She is a very friendly contact in the social media. That book passed the ultimate litmus test: it improved an aspect of my life for the better. I no longer live in blind dread of my dog developing health issues, as I know I have a guide to cope with them. Not really related to dog behaviour, but a great book all the same. Browse the Book Review archive. Genre: owner manual. Author: Kay Nancy. Reading Level: Owners. Star: 4. Bookmark the permalink. Post a comment or leave a trackback: Trackback URL.